Yes my lactose free pound cake is smiling a beautiful strawberry smile! I found this really good recipe and only had to alter the milk so I could use lactose free milk or soy milk. 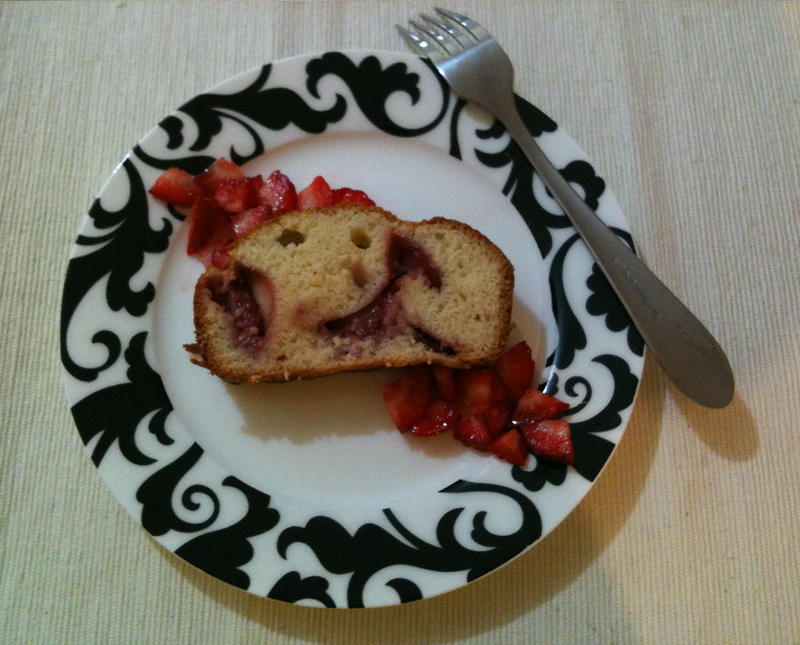 The strawberries were placed on the bottom of the loaf tin but made there way up through the cake but I guess this is good too as it added some deliciously sweet strawberry flavour throughout. It worked out really well. Just make sure you don't over beat otherwise it will get a little rubbery! Don't ask me how I know, I just know hahahaha. Grease and line medium sized loaf pan with baking paper. Mix eggs and sugar until fluffy. Add milk, oil and vanilla and blend. Sift flour and baking powder and then add to wet mixture. In base of tin sprinkle brown sugar and then place slices of fresh strawberries. Pour in mixture. Bake for 50 minutes. Once cooked take out of oven pull out baking paper and let cake cool on a cooling rack.